19 N. K. Jerne and A. A. Nordin, Science 140,405 (1963). 21 A. Rosen, P. Gergely, M. Jondal, G. Klein, and S. Britton, Nature (London) 267,52 (1977). 22 E. A. Gronowicz, A. Coutinho, and F. Melchers, Eur. J. Immunol. 6, 588 (1976). 23 J. D. Sedgwick and P. G. Holt, J. Immunol. Methods 57, 301 (1983). 24 C. C. Czerkinsky, L.-A. Nilsson, H. Nygren, O. Ouchterlony, and A. Tarakowski, J. Immunol. Methods 65, 109 (1983). 25 J. Ronnelid and L. Klareskog, J. Immunol. Methods 200,17 (1997). 26 C. C. Czerkinsky, G. Andersson, H.-P. Ekre, L.-A. Nilsson, L. Klareskog, and O. Ouchterlony, J. Immunol. Methods 110,29 (1988). 27 M. Steinitz, A. Rosin, and G. Klein, J. Immunol. Methods 136, 119 (1991). 28 P. Schielen, W. van Rodijnen, T. Tekstra, R. Albers, and W. Seinen, J. Immunol. Methods 188, 33 (1995). 29 A. Lalvani, R. Brookes, S. Hambleton, W. J. Britton, A. V. S. Hill, and A. J. McMichael, J. Exp. Med. 186,859 (1997). Fig. 1. Principles of the ELISpot assay. the binding of a biotinylated "indicator Ab" directed against an antigen epitope different from that recognized by the capture Ab. 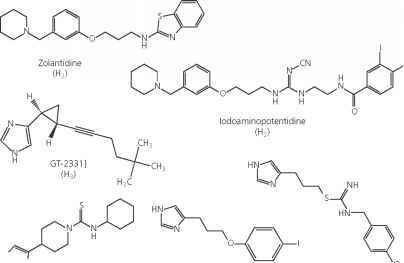 The imprints or immunospots are then developed by an avidin-biotin-enzyme or streptavidin-enzyme conjugate. Alkaline phosphatase with its chromogenic substrates is the enzyme system of choice. One immunospot corresponds to one secretory cell. The total number of spots in a well can be enumerated manually with a stereomicroscope or, preferably, analyzed by an automated imaging system instrument. 30 A. Soderberg, B. Sahaf, A. Holmgren, and A. Rosen, Biochem. Biophys. Res. Commun. 249, 86 (1998). Note. The two anti-TrxR MAbs are of IgGi(/c) type; they are designated anti-TrxR clone 2 and anti-TrxR clone 3 and are specific for native placenta-derived human 58-kDa TrxR (TrxRl) as tested by Western blot.30 These MAbs do not react with TrxR2 (65 kDa), as described by Sun et al.,31 or with mitochondrial TrxR, as described by Miranda-Vizuete et al,32 (A. Rosen and G. Spyrou, personal communications, 2000). 31 Q.-A. Sun, Y. Wu, F. Zappacosta, K.-T. Jeang, B. J. Lee, D. L. Hatfield, and V. N. Gladyshev, J. Biol. Chem. 274,24522 (1999). 32 A. Miranda-Vizuete, A. E. Damdimopoulos, J. R. Pedrajas, J.-A. Gustavsson, and G. Spyrou, Eur. J. Biochem. 261,405 (1999). 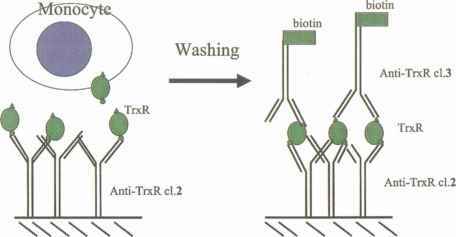 The protocol for the TrxR ELISpot assay is described below, and the procedure for detection of truncated Trx and full-length Trx follows the same protocol except for the antibodies used. We have included troubleshooting advice as notes at appropriate points. Please observe that we have used sterile filtered solutions (0.2-/im pore size) throughout the procedure, and that the microtiter plates have been handled in sterile hoods until the step of cell removal. 1. Prewet the nitrocellulose-bottomed 96-well microtiter plates (MultiScreen MAHA4510) by addition of 200 /¿I of distilled water for 30 min. Add 100 ¡i\ of anti-TrxR clone 3 (15 /xg/ml) or control anti-TNF Ab diluted in PBS to sterile nitrocellulose-bottomed 96-well microtiter plates (MultiScreen MAHA4510). Divide the plate into sections to allow space for three to six replicates of each of the following cell samples (PBMCs or monocytes): (1) unstimulated cells and (2) stimulated cells (mitogen LPS, IL-1, and IFN-y; PMA and ionomycin; or fMLP; or oxidative stress generators diamide and selenite). Include the following controls: (1) anti-hTNF-a MAbs (15 /¿g/ml) as a positive control for secretion, (2) replicate wells containing capture and indicator Abs in the absence of cells; and (3) a control for nonviable/necrotic dying cells. Treat the cells with detergent [0.1% (v/v) Tween 20] after adding the cells to the plate. 2. Incubate the plates overnight at 4° in a humidified chamber. Note. If PVDF plates (MAIPS4510 or ELIIP10SSP) are being used, note that an extra pre-wetting step is required. Add 100 /il of 70% (v/v) ethanol per well, incubate the plates for 5 min, and rinse in 200 /¿l of sterile distilled H20 (three times) followed by 200 /il of PBS (three times). 33 C. Kintner and B. Sugden, Nature 294,458 (1981). 3. Decant the Ah solution from the plates by flicking them upside down, or by attaching the plates to a vacuum manifold for flowthrough emptying. Wash the plates four times with sterile PBS (200 //l/well). At each washing step, let the plates stand for 5 min in PBS. 4. Block the remaining protein-binding sites on the solid-phase nitrocellulose by addition of 200 ¡i\ of RPMI 1640 medium containing 10% (v/v) FCS and incubation for at least 2 hr at 37°. a. Carefully add 15 ml of buffy-coat cell suspension, prediluted 1:2 in RPMI 1640 medium, on top of 30 ml of Ficoll-Paque liquid in a 50-ml tube (Falcon; Becton Dickinson Labware, Lincoln Park, NJ). Centrifuge at 400g for 30-40 min at 18-20°. b. Collect the cells at interphase. Wash the cells in 3 volumes of PBS, twice. c. Count the cells in a Biirker chamber. These cells constitute the PBMC population. Set aside half the cell number for ELISpot and suspend them in RPMI 1640 medium with 5% (v/v) FCS to a concentration of 106 cells/ml. The second half is used to isolate pure monocytes. Suspend these cells in AIM-V medium to a concentration of 5 x 106/ml. Continue as follows. a. Precoat 75-cm2 tissue culture flasks by addition of 5 ml of 2% (w/v) gelatin dissolved in distilled water. Incubate the flasks for 2 hr at 37°. Remove the gelatin solution by vacuum aspiration and allow the flasks to dry. Add 10 ml of autologous plasma; incubate for 30-60 min at 37°. b. Remove the plasma by aspiration, and wash twice with PBS. c. Add 15 ml of PBMC suspension, prepared as described above (5 x 106/ml), in AIM-V medium to each flask, and then incubate the flasks for 40 min at 37°. d. Remove nonadherent cells by gently washing three times. 34 A. B0yum, Clin. Lab. Invest. 21(Suppl. ), 77 (1968). 35 B. Freundlich and N. Avdalovic, J. Immunol. Methods 62, 31 (1983). e. Detach the remaining adherent monocytes by addition of 10 ml of a mixture containing 5 ml and PBS with 5 mM EDTA and 5 ml of AIM-V medium. Incubate for 15 min. Cells are then collected and pelleted by centrifugation and resuspended in RPMI 1640-5% (v/v) FCS to a density of 1 x 106 cells/ml. Note. The monocyte-macrophage cell purity is >90%. Cell viability is determined by trypan blue dye exclusion; the cells are counted in a Biirker chamber. For stimulation of PBMCs or human monocytes, the following reagents are used. Note. Monocytes adhere easily to plastic tube walls, and therefore it is preferable to distribute cells first into microtiter plates, and then to add stimulating reagents, rather than to stimulate cells in tubes before plate distribution. 5. Decant the blocking medium. 6. Add 100 pi of the cell suspension in RPMI 1640 with 5% (v/v) FCS containing 105 cells to each well. Add the seven stimulating reagents to cells (in 5 ixl) in six replicates. 7. Incubate the cells in 5% CO2 at 37° in humidified air for 20 hr. Note. Use an isolated incubator in which there is minimal disturbance or movements such as opening and closing doors. This prevents cells from moving, thus avoiding poorly defined spots, streaks, etc. The incubation time must be optimized for each cell type and stimulation protocol. The suggested time of 20 hr has been optimal for Trx and TrxR. Ten to 40 hr of incubation should be tested. 8. Remove cells from the microtiter plates by three washes in PBS and three washes in PBS-0.05% (v/v) Tween 20. Note. Careful washing is necessary: Cell fragments sticking to the solid phase and disturbing the assay will form if PBS-Tween washing buffer is used before PBS washings. Inspect the solid-phase surface for remaining cells. The surface should appear smooth; if not, further washing may be required. 9. Develop the microtiter plates by addition of 100 ¡A of biotinylated anti-TrxR clone 2 or biotinylated anti-hTNF, respectively, diluted to 300 ng/ml in PBS-T with 0.1% (w/v) BSA. Incubate the plates for 2 hr at room temperature in a humidified chamber. 10. Wash five times with PBS-T.
11. Add 100 ¡A of Vectastain ABC-AP or streptavidin-alkaline phosphatase diluted 1:1000 in PBS-T with 0.1% (w/v) BSA. Incubate the plates for 1 hr at room temperature in a humidified chamber. Note. We recommend sterile filtering the substrate solution through a 0.2-//m pore size filter before use. 12. Wash the plates six times in PBS. 13. Add 100 fi 1 of BCIP/NBT substrate solution to the wells. Incubate the plates for 30 min. Monitor the color development visually; check for staining in negative control wells. 14. Stop the reaction by rinsing the plates three times in distilled water and then remove the underdrain of the plates. Rinse the plates three times in tap water. Empty and dry the plates carefully, first on a paper towel upside down and then overnight at room temperature in the dark. 15. Enumerate the spots in each well, using a stereomicroscope (Nikon [Garden City, NY] model SMZ-1B; x35 magnification). Calculate the median value for each of the six replicate wells. For objective enumeration of the ELISpot assay, we use an ELISpot reader instrument for automatic imaging analysis and counting (Autoimmun Diagnostika [AID], Strassberg, Germany; www.elispot.com). Statistical differences between stimulated and nonstimulated control cultures of monocytes or PBMCs are evaluated by the nonparametric Mann-Whitney U test. All statistical evaluations are performed with JMP version 3.2.5 (SAS Institute, Cary, NC; JMPdiscovery.com) software and a Gateway G6-300 PC microcomputer.